A practical and cute creme placemat for use under the bowls of your dog or cat. It has a lovely print. Dimension 40 x 60 cm. 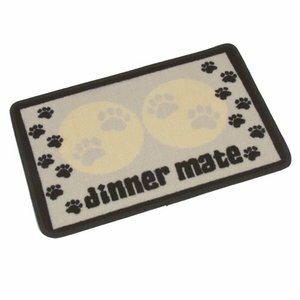 You place this mat under the bowls of your dog or cat. The placemat ‘Dinner Mate’ makes a perfect resting place for your dog’s food and water bowls and makes sure that any spills are absorbed and do not become ingrained into your carpet. This will obviously protect your floor from absorbing mess by acting as a barrier, as well as looking a great addition to your décor. With its grip ability this mat will not move easily when in use and is fully machine washable when necessary. 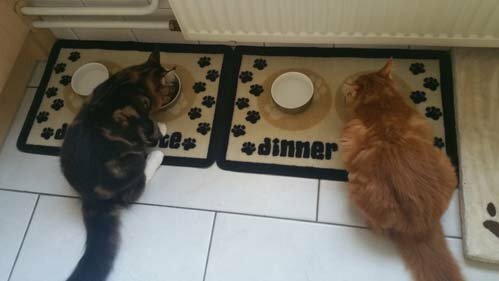 With space for both water and food bowls, they will never be strewn around the kitchen again. The quirky design shows any visitors that there is a well cared for pooch in residence as well as a well cared for carpet! The placemat is fitted with an anti-slip layer. 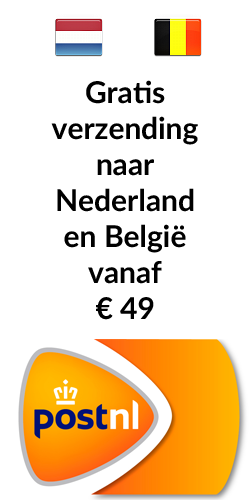 You can wash the mat easily in the washing machine. Dimensions: 40 x 60 cm, in creme.